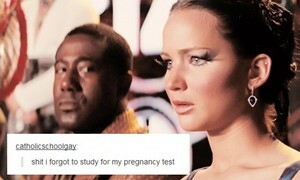 The Hunger Games | Tumblr Text Post. . Wallpaper and background images in the Hunger Games club tagged: photo. This Hunger Games photo contains portrait, headshot, gros plan, and closeup. "I'll now try to pretend like I actually knew about this pregnancy of mine"